In the past years, web development has got more and more ingrained. We tend to use the web for every purpose: shopping, banking, or reading news. The demand for web development talent is higher than ever, and the scope of what web developers can do is enormous! A hot topic that has taken the traditional website trend by storm and is catching more and more attention is virtual and augmented reality. 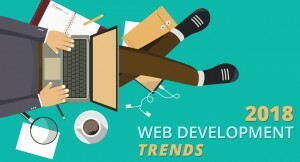 Apart from gaming, this web trend has also left its blemishes on websites. Tech giants like Mozilla and Google have started innovating APIs to assist VR technology transitions to the web. As a standard has been developed, we can expect more and more web apps to be developed using virtual reality. These tools can create websites from layman or plain text, usually stored in files and not in databases. Websites built with the help of static generators feature functionalities like best-in-class security, increased speed, ease of deployment, and easy navigation. However, these websites do not portray real-time or user content (such as comments on the website). AI is always high on the agenda whenever we talk about futuristic technology. Many web trend changes have been made in the past few years with the help of artificial intelligence. Some of the critical website development companies in Denver have been releasing their AI technology to be used by the public. With the pace of technology advancements, you can expect a plethora of evolved AI technologies by the end of this year. Long gone are the days when websites used traditional e-mail systems to contact customers. More and more businesses are stepping into this field and are deploying chatbots on their websites as their customer service representatives. Chatbots are also assisting companies in boosting up sales, addressing resolutions to customer queries, and most importantly : the audience likes them. In short, chatbots provision twofold benefits. The fresh face of website trends is IOT. With the advancement in web technology, IOT is overtaking traditional web elements and is setting new benchmarks. The IOT is a swift movement where non-internet based objects are provisioned with network connectivity to receive and send data. The objects can vary from motors or sensors which can then be used for multiple purposes. Web developers may not directly take part in the evolution of these devices. However, it’s likely to develop in the shadow of applications that display data devices. That’s not it! There are many projects in construction that are to be released soon and will take over the web market with their soothing functionalities and state-of-the-art designs. Web development is a never-ending ocean, and we cannot predict what comes next.